Red spots on skin can appear for a number of reasons. While it's good to be mindful of sudden changes and stay on top of anything that feels or appears different, it's not always necessary to worry about random marks on the skin. Instead, get familiarized with the various conditions that might cause red marks and understand when a physician's advice might be needed. Also known as "macules," acne scars are the flat marks left in the wake of a blemish that has healed. Usually these marks are red or brown. They often aren't permanent, but they can certainly take their sweet time fading. Sun exposure is also a culprit in impeding the healing process. The right product regimen and proper acne skin care regimen can speed it along a bit. Managing your acne early may also decrease the amount of scarring you develop as well. Easily the simplest type of red spot to identify, a red birthmark, also known as a hemangioma, is a pigmented spot that develops at or just before birth. These marks are associated with blood vessels. There are several varieties of hemangiomas, ranging from the typical strawberry mark that appears on the face or scalp to the rich port-wine stain as seen on Mikhail Gorbachev. Some of these are temporary and do not require treatment, while permanent marks can be covered with a heavy concealing makeup or surgically removed in some cases. Medications may help certain types of hemangiomas and laser therapy may improve the appearance of port-wine stains. Caused by conditions known as purpura or petechiae, blood spots form under the skin and reveal themselves on the surface. Purpura spots resemble bruises where blood vessels may be leaking under the skin, while petechiae spots are flat and red (or purple) and are smaller versions. These spots may appear as a result of infection; bleeding or clotting disorders; vasculitis; certain medications (such as blood thinners or aspirin); certain diseases (such as lupus, leukemia and cirrhosis); and malnutrition, to name a few. Treatment should be sought for the condition that caused the abnormal spots. 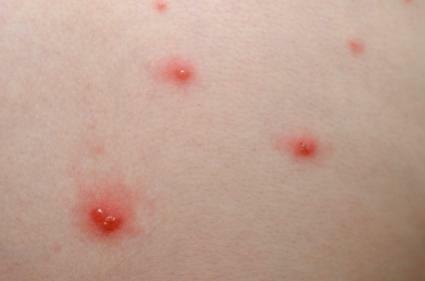 These small bumps are firm and may present themselves as either brown or red. Dermatofibromas may occur at the site of a previous injury like a bug bite. They are caused by excess accumulation of scar tissue or collagen beneath the skin, but the reason that people develop these lesions are not well understood. They're commonly found on the legs, and can be surgically removed if accompanied by uncomfortable symptoms (such as itchiness or pain). The result of an excess growth of small blood vessels and swelling, pyogenic granulomas are raised and appear either brown, blue-black or red on the skin. They are typical in the aftermath of an injury, and may disappear on their own. If not, however, they may be surgically removed. Some may regrow after surgery and may need a repeat treatment. Tests -- like a biopsy -- may also be conducted to rule out the possibility of cancer. Its exact cause is unknown, but it has a tendency to afflict those with very fair skin. Rosacea may present with a spate of red bumps or pimples on various parts of the face, often accompanied by flushing. Small red veins that resemble spider webs may also be apparent from time to time. These symptoms can last for several days. Patients can control their symptoms with a variety of medications like antibiotic pills or creams, stronger acne medications like Retin-A, or laser surgery to lessen scarring. However, there is no actual cure for rosacea. There are other possibilities for those red marks on your skin. A number of skin rashes could be the culprit such as a heat rash or an insect bite rash. A skin infection may also cause red marks as well. There are some more serious causes for red marks like skin cancer; these often present as a red mark or sore that won't heal. If you suspect this or notice other suspicious changes, you should visit your physician for further evaluation. Determining the actual cause of your red spots is the best way to figure out how to treat them. If you recently had a superficial skin injury that you may have scratched at some point, you can count on a little redness to show up. Treating it with an over-the-counter antibiotic cream may be sufficient. Acne scars, too, don't usually require medical attention. Other types of red marks - like a rash that is getting worse or an infection that won't go away -- may require medical attention. If you are concerned about the appearance of a red mark, feel pain associated with one, notice the mark getting bigger, or just want the opinion of a health care provider, you should visit your dermatologist.